All original lullabies with full production. Grammy finalist "Best Musical Album For Children"
"A Child's Gift of Lullabyes" is the most successful selling Lullaby recording in history. A Grammy finalist in "The Best Musical Album For Children" and "Parents Choice Award" also a "Dove Award" finalist. The album consist of all original Lullabies and fully orchestrated. 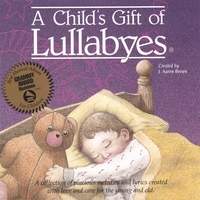 In addition to the nine Lullabies with vocals, an instrumental version of all songs is also included that a parent might learn the songs and sing along. The success of "A Child's Gift of Lullabyes" has created International demand and has been recorded in six languages. Namely English, Spanish, Dutch, German, Korean and Japanese. Don't let your children miss out,or yourself. A must for children under 10. A must for those who didn't have it before 10. Extremely soothing. Creats an atmosphere of calm gentleness a family needs. Especially with a newborn. Has an instant calming effect on rambunctious children. I know, I have 4, 5yrs and under!!! I bought your cd when my daughter was born. I memorized all of the songs and sang them to her over and over again. She is eighteen now, and the other day she was singing some of the songs that were on the cd. I lost the cd when she was three so I thought that she had forgotten all the beautiful songs. I could not believe it when she asked if she could get online to see if she could find it to order. She rides with the cd in her car now and all her friends love it! I'm sure she will keep the cd and sing the songs to her children just like I did when she was small. Thanks for such beautiful music! i used to share a room with my little brother. and he liked this tape a lot. he always asked me to play the lullaby tape, so i turned it on every night and he would fall asleep almost immediately. but i would leave the tape on and think about what a great little brother i had, and how he was such a great little guy. my favorite song was, tomorrow we go to the fair, and i always dreamed that i could take my little brother to a fair. i thought about how nice of a time he'd have there. i periodically think about this music and it always makes me happy, and i wish i could be in that room again and see his little blonde head of hair, and the peace across his face as he slept. I was given this tape at a baby shower for my first child. She fell in love with it before I did. The gentle songs lulled her into a peaceful sleep. I fell in love with it too. Now on my 3rd child, my tape wore out so I ordered 2 CD's... can't imagine a nursery without this CD playing! This is a beautiful CD! I rocked my son to sleep EVERY night with this. He is now 9 and hearing it brings back so many wonderful memories. Whenever I have a friend or relative expecting this the 1st gift I buy. I loved this when my two teens were babies ! My children are 13 and 15. I first heard this CD (as a cassette tape) when I was expecting the 15-year old. I sang those songs so much, I still know the words to some of them. I have a new baby neice so I bought this CD for her and my sister-in-law to enjoy. It is precious! I had this album when my 19 year old was a baby. I had this album when my 13 year old was a baby. I was thrilled to find the cd on CD baby. It is a timeless classic that sings my newboarn to sleep as well as brings back fond memories for the entire family. We are thrilled to hear the songs again! I came across this CD at the public library while looking for lullabies to sing to my new grandbaby. I was so pleased with it; I purchased a copy. The songs are soothing and easy to remember. The CD is always in my car. My grandbaby likes it so much she even tries to sing along. I have a copy in my vehicle and one in my pc. at home. When I was young, my mom bought me a mother goose lamp that had a tape that played these songs on it. We gave away the lamp, and I lost the tape. Since then I had looked for these songs so that I can play them to my children. Now that I'm pregnant with our first child, they mean even more knowing he/she will get to enjoy them as much as I did!